Located in the heart of Orlando beside International Drive, Vista Cay By Millenium offers a luxurious stay, where guests are perfectly situated to explore all of the exciting attractions - which are just a stone’s throw away. Set amid a gated resort, these condos are close by to all the shopping, entertainment and food and drink attractions in the area. The thrills and spills at SeaWorld are a mere 2 miles away, with the Orlando Universal Resort only 3 miles distance. The Vista Cay By Millenium has 2 pools, a fitness centre, modern condo’s and 2 and 3 bedroom options which can sleep between 4 and 6 people. There is an onsite bar, BBQ area, theatre room and pets are allowed too. If you’re dreaming of deluxe accommodation in the heart of Orlando, then this fabulous resort has everything you need for a relaxing or active stay in Florida. 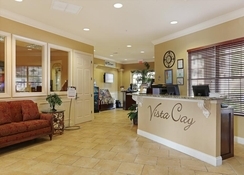 The Vista Cay By Millenium is found in the heart of Orlando between Universal Boulevard and International Drive so it provides a great starting point to explore SeaWorld, Universal Studios, the Florida Mall and Walt Disney World. The Orlando International Airport is just 8.5 miles away. For any avid golfers, the Shingle Creek Golf Club is right across the street. There are 6 accommodation types to choose from at the Vista Cay By Millenium. Deluxe 2 Bedroom Apartments and Premium 2 Bed Apartments can sleep up to 4 people while Premium 3 Bed Apartments, 3 Bedroom Townhouses, Deluxe 3 Bedroom Apartments and a 3 Bedroom Apartment With Lake View can sleep up to 6 people. Each of the rooms come equipped with laundry, cooking and dining facilities as well as Wi-Fi and a modern design. Each room has air-conditioning, and some will feature a balcony or patio, too. 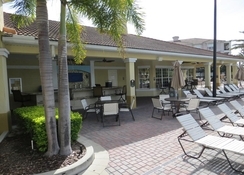 There is an on-site pool bar that is open from 11am to 10pm and also provides a range of snacks. You can have food delivered from over 20 restaurants in the local area if you fancy a quiet night in after a jam-packed day. The Vista Cay By Millenium is close by to an array of dining options including the Disney Springs entertainment complex (spectacular for magical evenings), Universal Studios Plaza and International Drive is just a short walk away from the resort. The Shingle Creek Golf Course is less than a mile from the Vista Cay By Millenium and provides a challenging but rewarding experience on a course that was created by the Arnold Palmer Design Company. Staying here means that you are close by to the major attractions in Orlando which include SeaWorld (1.6 miles), Universal Studies (3 miles), Florida Mall (3.5 miles) and Walt Disney World (8 miles). So guests will never be short of entertainment.